What is a Mediterranean diet? A typical Mediterranean diet includes lots of vegetables, fruits, beans, cereals and cereal products, for example wholegrain bread, pasta and brown rice. It also contains moderate amounts of fish, white meat and some dairy produce. How does it work? As research into the benefits of this type of diet is on going, there may eventually be certain foods that are found to have greater significance for health. For now however, it seems it is the overall diet approach and the combination of foods, rather than individual ‘superfoods’, that make this such a healthy way to eat. Although we are some way from the warm Mediterranean coast, it’s still possible to adopt this style of eating without making massive changes. 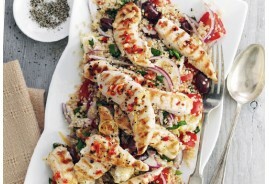 Try out our favourite Mediterranean recipes today.